When Roger gave a talk to the Bexley Historical Society in June 2013 I looked at the photos of the Elizabethan and Georgian buildings and I noticed similarities between the two buildings. The Elizabethan house has a wider (3 bay) central wing 3 windows wide flanked each side by a newer section with one window. This pattern repeats on the Georgian building. The Elizabethan building shows one chimney stack each side running front to back and it’s the same on the Georgian building. 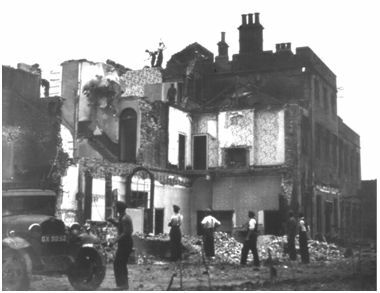 To the left is a chimney stack on the side wing running left to right which is also visible on the Georgian building. It shows a wall running back into the building at this point. It is likely that the Georgians found it easier to join their new wall a bit back from the corner as bricks are interlaced at the corner. I think that this is not a drawing of the building as it existed but a plan by a builder showing how it could be modified. The Dutch gable probably exists already as this feature had gone out of fashion by 1751 so they are unlikely to be proposing this as a new feature. The columns supporting the canopy with a canted bay and pediment above the bay are Renaissance style details made popular in Georgian times. (They do sit awkwardly against the Dutch gable). On drawings the windows are not drawn in but appear in a schedule alongside suggesting it was a proposal or maybe to indicate assessment for window tax. The Elizabethan drawing shows four round columns dividing up the central section with a central door with one window to each side. This appears on the Georgian building but they used thicker square brick columns. One thing that doesn’t seem to coincide is the proportion of the central wing to the narrow single window wings each side. I worked out why. On the Elizabethan building the central section is narrower that on the Georgian one making the wings appear narrower in the Georgian building. This widens the central section and narrows the width of the side wings, which is why the side wings appear narrower and there was only room for one narrow window on the ground floor, rather than the two shown in the proposal on the Elizabethan building drawing. This means that within the building the Georgians built new walls outside the Elizabethan walls. 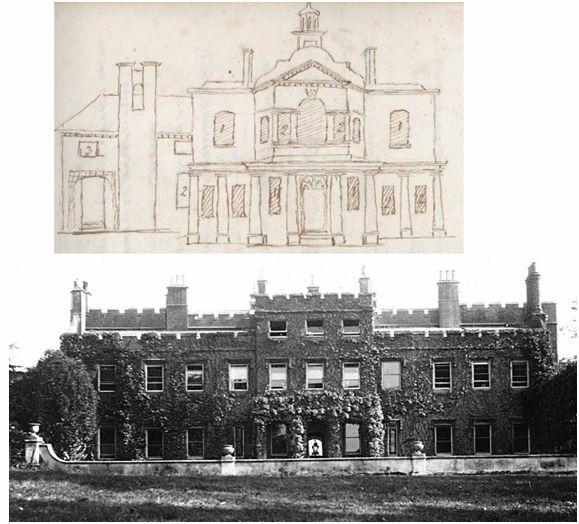 (This is the same approach that was found at Bexley Manor house). Why would they do this at Blendon? The reason is to do with what the walls support. The Elizabethan building was only two storeys but the Georgians wanted an extra floor on top. 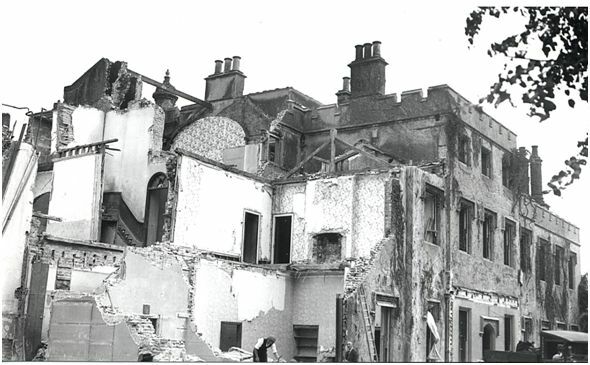 They probably decided the Elizabethan walls wouldn’t be able to support the extra load so they put in new walls to support the top floor and roof, while keeping the original two storey section and carry on living inside. This theory could be proven if we were to find parallel foundations of Elizabethan and Georgian walls within the building showing where the Georgians built and enclose the Elizabethan building.